Grant Fellows was born in Hudson Township, Michigan, on April 13,1865. He was educated in the district schools and Hudson High School. Fellows engaged in the practice of law in 1886, and in 1893 he became a member of the law firm of Fellows and Chandler. 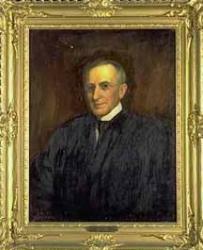 From 1901 until 1912, he was a member of the Board of Law Examiners. He was elected to the office of Attorney General in 1912 and re-elected in 1914. At the Republican State Convention held at Saginaw on September 28, 1916, Fellows was nominated for Justice of the Michigan Supreme Court, was elected in 1916, and began service in 1917. He was re-elected in 1923. Before writing an opinion, he consulted every authority cited by counsel both in the briefs and in the arguments, and if it was a doubtful case he even took the initiative to go outside of these authorities and examine the question himself. Grant Fellows died on July 16, 1929, while in service to the Court.